It's the sweetest day of the year! Your scrumptious cupcakes can change the lives of abandoned, neglected and abused animals across Canada! Registration is now open for the 4th annual National Cupcake Day™ for SPCAs & Humane Societies, on Monday, February 29th, 2016. Hold your Cupcake Day party at work, school or at home and your guests can offer donations for delicious treats with all funds directed towards the life-saving work of your local SPCA or Humane Society. How sweet is that? Register for National Cupcake Day today! Should you walk your dog in the winter? While winter dog walking can sometimes be a challenge, it’s important to meet your dog’s exercise needs all year round—even in the winter. Not only will this keep your dog physically active during the winter months, it’ll also provide much needed mental stimulation. There are a few things to keep in mind for a safe winter walk. Read some of our great tips to get you through a long winter season. We’re starting the New Year with a fresh look to help give the animals a fresh start. Check out our newly designed website for great animal care tips, ways to get involved, how to report cruelty and much more. 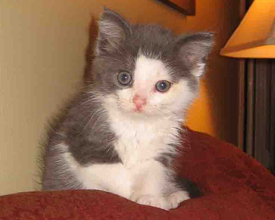 While you are on the website, check out some of the wonderful pets available for adoption. You might just find your next best friend! 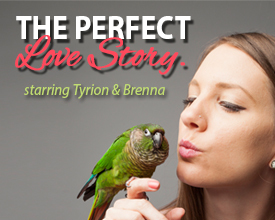 Have you ever thought of adopting a pet bird? They make great pets because of their relatively minimal maintenance and strong sense of companionship, not to mention how pretty and cheery they are! 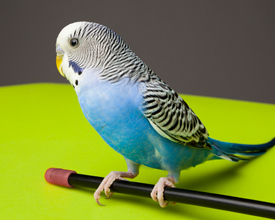 Watch our How To: Bird Care Tips video to learn whether bird ownership is right for you. 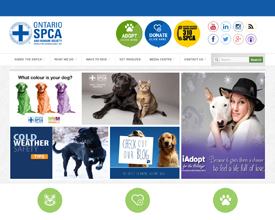 From November 1 – December 31, Ontario SPCA Animal Centres in partnership with 50 other participating SPCAs and Humane Societies across Canada, ran the iAdopt for the Holidays adoption campaign with the goal of getting as many animals as possible adopted into loving, forever homes. Over 5,000 animals, close to 1,500 of those from Ontario SPCA Animal Centres, found homes thanks to people like you either adopting or helping to spread the word. The winner of our grand prize online contest, winning free pet food for a year courtesy of Royal Canin, was ‘Maggie’ the cat (pictured above) and her owners from Amherstburg, ON. Congratulations! A big thank you to all who participated in this year’s campaign both online and through adopting an animal. You helped change lives this holiday season! It’s not too late to find the purrrfect gift for your Valentine this Valentine’s Day. Paws & Give™ has gifts for every kind of animal lover. For the animal lover who wants to support our front line investigators, check out Animal Rescue Supplies, or for the animal lover who is all about the care and attention animals deserve, check out Care for a Dog or Puppy or Care for a Horse. No matter who you are shopping for, every gift purchased supports the efforts of helping desperate animals in need across Ontario.